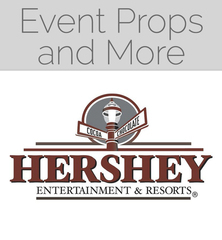 JAL103 Hershey Entertainment and Resorts warehouse clean-up auction # 1…selling assorted props and more. Check back Feb. 6th for more information. This will be the first in a series of 3 or 4 online auctions for HERCO properties. AUCTION CLOSING DATE: Fri., Feb. 15, 2019 beginning at 2:37pm. Bidding closes on the first item at 2:37pm , then closes at a rate of three items per minute thereafter in catalog order until bidding on all items has closed. This auction features extended bidding if anyone bids in the last 60 seconds, time will be added in 60 second increments until bidding activity ceases for 60 seconds. INSPECTION: Thurs., February 14th from 12:00 PM to 3:00 PM. It is strongly recommended that you inspect before bidding. There are some very large and bulky pieces. REMOVAL NOTES: Please bring a large enough truck / trailer (or trucks) and necessry tie downs for your purchases. Measurements will be in the descriptions. There is ground level and loading dock loading. Please bring all personnel and materials handling equipment that you will need. Call with any questions before purchasing. SHIPPING: We do not offer shipping for this auction, but you are welcome to make your own arrangements if you choose. NOTES: Please read down for complete terms of auction. There is a 15% Buyers Premium in effect for your purchases. You, or anyone picking up for you, must bring a copy of the paid invoice with you to remove your items. Small items / materials may not be packed, you will need to provide your own boxes, crates and tubs; we do not have any onsite. You will need to bring additional labor, floor dollies, pallet jacks or hand trucks that you may need to assist you in loading your purchases. We will provide forklift assistance for larger pieces as needed. Staff is not available to pack, carry or load your purchases; please bring all additional manpower that you will need to assist you. TERMS AND CONDITIONS PLEASE READ THESE TERMS OF SALE CAREFULLY, AS THEY HAVE BEEN RECENTLY UPDATED. Terms and Conditions of Sale These are the Terms and Conditions of Sale for this online auction. They consist of this introduction and thirty-one numbered paragraphs that outline the relationship between you (“the Bidder”), the operator of this website (identified above as the “Auction Host”), and the party coordinating the logistics of this online auction (identified above as the “Auction Manager”). The Auction Manager and the Auction Host are together referred to in these Terms and Conditions as “the Auctioneer,” and any reference to action that may be taken with respect to the Auctioneer may be taken with respect to the Auction Host or Auction Manager separately or collectively. Throughout these Terms and Conditions, the terms “Auctioneer,” “we,” “us,” and “our” will refer to the Auctioneer, and the terms “you” and “your” will refer to the Bidder. If you want to bid in this online auction, you will first have to certify that you have read, understood, and agreed to these Terms and Conditions. Such certification will function as your legal and binding electronic signature. If you choose to make this certification, these Terms and Conditions will become binding both on you and on the Auctioneer, and all parties will be expected to abide by the Terms and Conditions if any issues arise in connection with this sale. Please read these Terms and Conditions carefully! They contain important information about the online auction itself and your rights and responsibilities as a bidder. (a) If you associate a credit card with your account: After you have registered for this online auction, the Auctioneer will authorize the credit card you have placed on file for $1.00. This $1.00 deposit is not a charge, only an authorization hold; if you decide not to make any bids during this auction, or if none of your bids are successful, the Auctioneer will not take any money from your account, and the authorization hold on your $1.00 will be lifted in accordance with the procedures of your credit card provider and/or banking institution. If you fail to provide full payment for your purchases, the $1.00 authorization hold will be captured and applied toward your outstanding balance. (f) take any other action the Auctioneer deems necessary to effect the fair conduct of this sale or protection of buyers’, sellers’, or other parties’ interests. In the event a seller withdraws an item from this auction prior to the close of the auction, the Auctioneer may leave the item on the catalog and buy the item back on behalf of the seller to establish the Auctioneer’s earned commission and the buyer’s premium due to the Auctioneer from the seller. (a) Staggered Closing: This online auction will generally begin to close at a rate of three items per minute, every minute. Items’ closing times will be displayed on the website, but may be extended past their scheduled closing time, as a result of the Auctioneer’s dynamic closing feature. (b) Dynamic Closing: The closing time of an item is generally extended an additional one minute whenever a bid is placed within the one minute leading up to an item’s scheduled closing time. (iii) if the Auctioneer does allow for late removal, the Auctioneer is not required to allow for the late removal to continue for any given amount of time, and may set an end time for such late removal in the Auctioneer’s sole and absolute discretion. Any item not removed during the period during which the Auctioneer agrees to allow for late removal will be considered abandoned, pursuant to the terms of the foregoing paragraph. 23. Claims and Choice of Venue: Any claim or controversy arising out of or relating to these Terms and Conditions, or to any breach thereof, will be resolved exclusively by a state court having jurisdiction in York County, Pennsylvania, or in the Federal District Court for the Eastern District of Pennsylvania, where federal jurisdiction exists. Each party hereby submits to the jurisdiction and venue of such courts. You agree that all claims instituted by you will be litigated on an individual basis, and will not be consolidated with any claim made by another party. You agree that any judgments awarded may be applied to and collected from you personally or corporately. Should you file an action contrary to this paragraph, the defending parties may recover reasonable legal fees and costs. Further, if you bring a claim against the Auctioneer and do not prevail, and/or if the Auctioneer takes action against you as a result of your violation of these terms and conditions and is the prevailing party, you agree that you will reimburse the Auctioneer for all reasonable legal fees and costs including reasonable attorney’s fees. (vi) damage to your hardware device from the use of any Service. Some jurisdictions do not allow the disclaimer of warranties or exclusion of damages, so such disclaimers and exclusions may not apply to you. You assume total responsibility for your use of the website, and your sole remedy against Auctioneer for dissatisfaction with the Services is to stop using the website or any such Services. Regardless of the previous paragraphs, if Auctioneer is found to be liable, Auctioneer’s liability to you or to any third party is limited to the refund of your purchase price. 30. Governing Law: These Terms and Conditions will be governed by and construed under the laws of the Commonwealth of Pennsylvania.